Eichelberger Key to ’08 D? While we mostly lament the defensive tackle situation as the likely “soft spot” on the defense, and the praise mainly goes to A’i Ahmu, well, what about Eich? After all, big 77 does have some good girth inside (6-4, 325 last year) and experience the last three seasons. But he’s been mostly overlooked, and it’s not hard to figure out why. He hasn’t lit it up when he’s gotten his chance. 2005: Three tackles, one sack. 2007: Four tackles, one sack. Not exactly Rien Long. But like a lot of things new for the Cougs in 2008, it’s a whole new Eichelberger. Per the TNT’s Todd Miles, Eichelberger got serious about his body. How serious? He dropped 30 lbs, now a biscuit under 300, giving him an extra dimension of quickness that he hasn’t been able to flash in the past. And the weight loss isn’t just about taking off the shirt at the beach with a newfound confidence and swagger. It’s much more than that. And as Miles says, even all-league center Kenny Alfred has taken notice of the new and improved Eich. And what do you know, we’re roughly one week from kickoff and Eichelberger has emerged as a starter next to Ahmu inside. Not JC transfer Bernard Wolfgramm, not Toby Turpin, not anyone else but Eichelberger. Let’s not sugar-coat things however. A strong year would be a nice jolt out of him inside, but I don’t know if we’re suddenly looking at a budding star. But I don’t think we require him to make headlines. Simply stand your ground, eat some space, and the rest will fall into place. And as we’ve touched on in the past, a strong push by the defensive tackles have always been a staple of the best WSU defenses in school history. 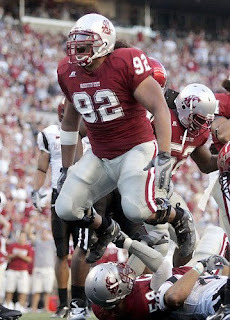 Jeremy Williams and Tai Tupai in 2003. Rien Long along with Williams and Tupai in 2002. Leon Bender in 1997. Chad Eaton and DON SASA(!) in 1994. Create havoc inside, and the trickle-down is beneficial to not only the d-ends, but the linebackers are suddenly free to do what they do best – RUN AND HIT. Looks pretty good, although of course, it is a highlight tape. But he looks physical, fairly quick, doesn’t give up on plays. Pretty intense too. And all those highlights were as an 18-year old freshman playing his first year of JC ball, so that’s a pretty impressive first year. And you have to like the special teams coverage. He looks like he could walk right on to the field next Saturday for the opening kickoff! ESPN’s Ted Miller has given WSU his best-worst case scenario treatment. Looks like 8-5 is the best we can do, and 2-11 is the worst. Personally I think the best case can be better than 8-5, but that’s if EVERYTHING falls into place. You know, we stay totally healthy, Rogers is a GOD at QB, the defense takes huge steps forward on the d-line and in the secondary, the special teams become an asset….etc. But will we really be a two-win team?? I mean even in Poop Island days of the late-90’s, we at least won THREE games! “We want to play the best players who are going to help us have success on that particular special team,” he said. “If some of our backups aren’t capable of helping us do well, we’ve got to play starters. Sigh. Someday we will have depth, but probably not much of it this year. One final note – please say an extra prayer for our own Hooty McBoob. We won’t go into the details here, but just know that a fellow Coug is dealing with a very difficult family situation right now. Our hearts and prayers are headed Hooty’s way. Hang in there brother. Have a great Thursday. 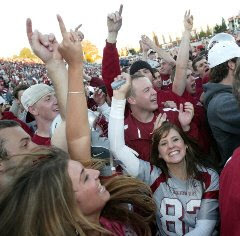 As always, GO COUGS. You are currently browsing the archives for the Matt Eichelberger category.